The articles contained within continue to be available online: Game Developer Magazine in the GDC Vault, Audio Implementation Greats at DesigningSound.org, Lost Chocolate Blog in the very same place it's always been, with a few articles and interviews strewn across the net-scape. There is something to pulling all of these together and the strength-in-presentation they acquire by doing so. A bit of history and hopefully some timeless insights into game audio and the process of discovering ones passion comes into focus through the 500 total pages across the two volumes. (It also highlights my curious relationship with words, phrasing, and my struggle to frame these ideas in a way that communicates passion and complexity.) A worthy en-devour for those who are interested in charting a path through time and possibly pickup some game audio nuggets of wisdom along the way. What a way it has been! My first-few articles writing for Game Developer Magazine, reviewing audio middleware tools, or the Audio Implementation Greats Series, attempting to highlight the unique position of audio implementation and elevate it into an art in-its-own-right, feel like the first-steps on a journey that I've been on since taking the first steps so long ago. The inappropriate grammar, the run-on sentences, the oblique references, the terrible 1980's song quotes, all align in what I hope is an enjoyable expedition into the mind of a technical sound designer. Wild pontification on everything interactive audio: from the now-past to potential futures and beyond! Meanwhile, somewhere between-the-lines of various interviews, a loose definition of Technical Sound Designer can be found. A sticky-wicket to nail down, the nomenclature once quothed by Rob Bridgett, Technical Sound Designer has grown to encompass many things to many people and potentially surpasses the narrow restriction of language in doing so. For an industry that has continued to fan-out in specializations (See "Knowing a Thing Or Two" in Volume 01) is there room for a "Technical Music Designer"? What about a "Technical Audio Director"? Where does that leave "Audio Implementor"...does that imply entry level experience? The exciting part is that this is all being discussed TODAY and will likely continue to be a nebulous blob of uncertainty for a while. Maybe you'll come across some wild terminology within these two volumes that has settled into a kind of standardization. When I first jumped in, nobody could decide what to call an Event. Since then, with the help of audio middleware, we seem to be equipped with much of the vocabulary we need to discuss our craft. Then along came VR Audio and things are just getting started again. But before I get ahead of myself, I just wanted to take the time to thank everyone for their support and inspiration over the years. A project (or career) of this scope does not happen by itself or without the help and understanding of many people along the way. Thank you. 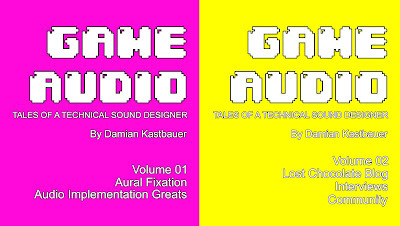 If you have a chance to read through these florescent tomes of game audio, feel free to drop a line and let me know how it went. I'd be fascinated to hear about your epiphanies or frustrations with these writings.